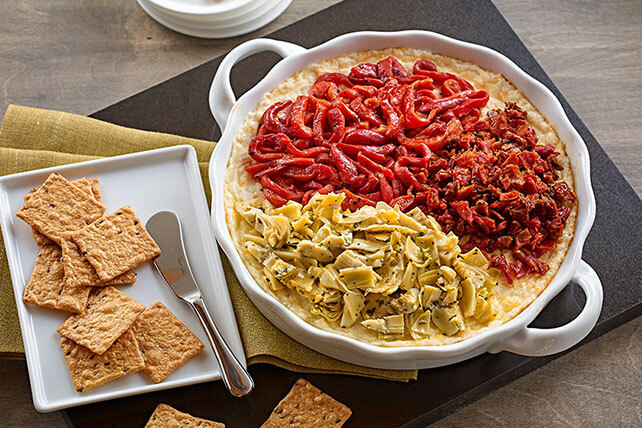 Artichokes, red peppers and sun-dried tomatoes give this palate-pleasing cheesy dip both color and flavor. Spoon into 9-inch pie plate. Bake 10 min. ; stir. Arrange tomatoes, artichokes and peppers over cheese mixture in three separate sections. Bake 10 min. Mix cheeses and mayo; spoon into baking dish. Cover. Refrigerate until ready to bake. Bake 15 to 20 min. or until heated through, stirring after 10 min. Substitute 1 large tomato, seeded and chopped, for the sun-dried tomatoes. Mix cream cheese, mozzarella, mayo and garlic until well blended. Spoon into 9-inch microwaveable pie plate. Microwave on HIGH 3 min. ; stir. Arrange tomatoes, artichokes and peppers over cheese mixture in three separate sections. Microwave on HIGH an additional 2 min. Prepare using PHILADELPHIA Neufchatel Cheese and KRAFT Light Mayo Reduced Fat Mayonnaise.